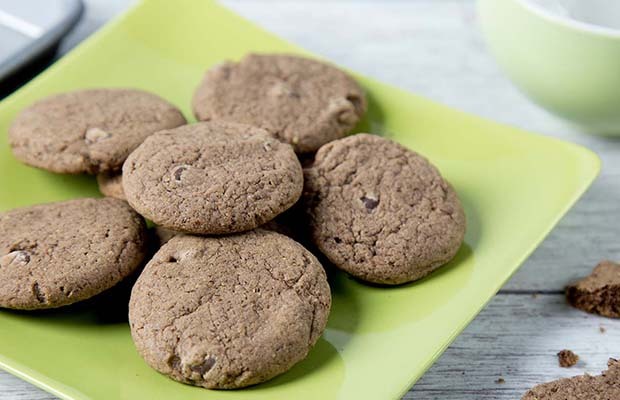 Nothing tastes or smells as good as a freshly baked batch of chocolate chip cookies. Preheat oven to 350 ⁰F (180 ⁰C). In a bowl, combine flour, milled flax, chocolate chips, cocoa, baking soda and salt; mix well. In a separate bowl, beat together brown sugar, granulated sugar and egg until sugars are dissolved. Add margarine and vanilla to the egg mixture; mix well. Stir in dry ingredients. Knead dough with your hands to mix in ingredients. Cover dough and chill in refrigerator for 1/2 hour**. Lightly spray cookie sheet with non-stick spray; wipe off excess. Lightly coat hands with vegetable oil or nonstick spray to handle cookies easier. Measure 1 Tbsp (15 mL) chilled dough, roll and flatten (Canadian loonie coin size). ***Place on cookie sheet 2 inch (5 cm) apart. Bake for 12 minutes. Remove from oven and cool on wire rack for 5 minutes. Remove from tray and cool to room temperature. Serving Size: 2 cookies. Each serving size contains 1 tsp (5 mL) of flax. ***These cookies require forming because of the decreased amount of shortening.